Courtesy Photo The Consolidated Electric team took first place at the Morrow County Chamber of Commerce Golf Outing held at Pine Lakes Golf Course. Left to right, Consolidated Electric Team members Brandon Miller, Brad Ebersole, Van Lehman and Bob Branstetter. Donna Carver | Morrow County Sentinel Morrow County Chamber of Commerce administrative assistant Jeanine Girard checks in participants of the annual Chamber Golf outing held at Pine Lakes Golf Course. Donna Carver | Morrow County Sentinel Beverage Cart sponsors Morrow County Dental, Dr. Leslie A. McDougall, DDS. and her staff pose with the four members of their golf outing team prior to the start of the Morrow County Chamber of Commerce annual Golf Outing. Beverage Cart sponsors, Herb Baldwin and Carol Lessick, Howard Hanna Home Team, pose prior to the start of the annual Morrow County Chamber of Commerce Golf Outing. 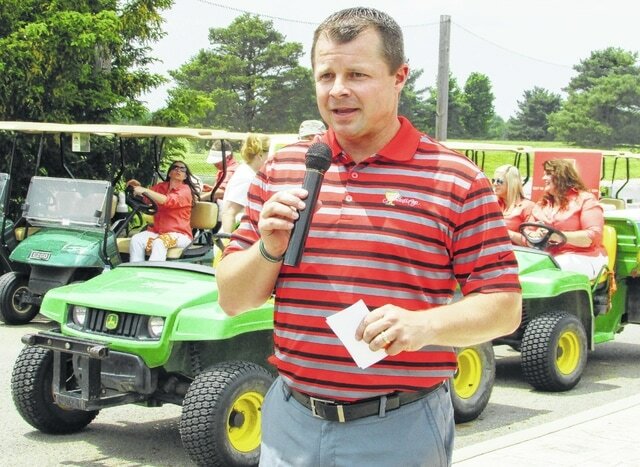 Donna Carver | Morrow County Sentinel Morrow County Chamber of Commerce Board President Andy Bower of Edward Jones Investments welcomes attendees and gives last minute instructions to golfers. Fifteen teams of four members participated in the annual golf outing to benefit the Morrow County Chamber of Commerce held on June 5, 2015 at Pine Lakes Golf Course in Mt. Gilead. The event was coordinated by Chamber Board President Andy Bower of Edward Jones Investments. Taking First Place and dethroning reigning Champions Dennis Leader Financial, was the team from Consolidated Electric. Team members were Brad Ebersole, Brandon Miller, Van Lehman and Bob Branstetter. 2nd Place: Mary Haven Team; Rich Steele, Wendi Reichardt, Doug Arnold, Chris Childers. 3rd Place: Del Co Water Team; P.K. Tudor, Brian Leach, Bob Jenkins, Bart Dennison. The Morrow County Chamber of Commerce would like to thank Pine Lakes Golf Course for their terrific hosting of their annual Chamber Golf Outing. Ace Sponsors Morrow County Hospital, Iberia Earthworm Construction and Consolidated Electric. Beverage Cart sponsors were Herb Baldwin and Carol Lessick, Howard Hanna Home Team, and Morrow County Dental, Dr. Leslie A. McDougall, DDS. Golf Hole Sponsors Snyder Funeral Homes, James Madison Insurance, ReMax/Patti Jackson, Kilgour’s Insurance Store, Cornerstone Cafe & Grill, Farm Credit Mid America, Lubrication Specialties (LSI), Cardington Yutaka Technologies, Griffith & Brininger, Edward Jones Investments, Andy Bower. Door Prizes were donated by Farm Credit Mid America, Southern Title of Ohio, Cornerstone Cafe & Grill, Consolidated Electric, Lubrication Specialties, Morrow County Hospital, Greg Gompf, Edward Jones Investments, Andy Bower. This is the 20th year for the Chamber’s Annual Golf Outing.